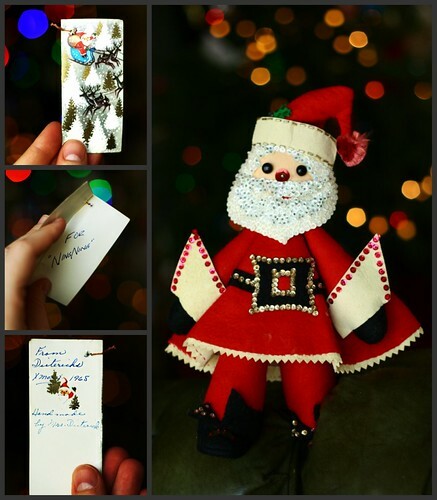 Thank you for taking the time to sew each little individual sequin, bead, and pompom onto this Santa Claus doll. He's living happily in our Christmasy living room. Thank you for leaving the gift tag on this doll that Mrs Deiterich made for you and obviously never touching it. And then donating it to the Salvation Army forty-four years later. Merry Christmas! It's like the Christmas decoration version of that site I love "Forgotten Bookmarks." wow - what a fantastic piece of history!! truly a wonderful find. My mother in law found a tiny box with a little piece of garland in it at the thrift store once. The box was labeled "Jimmy's First Christmas". She bought it, of course, & brings it out every Christmas then cries over the fact that someone would give it to the thrift store. That Santa is ADORABLE and even more so, the sentiment left behind on the tag. I treasure all of my Mother's old Christmas decorations and worry what will happen to them when I'm gone. Will they end up in a SA store? Not because my own family doesn't love them but because I know there just won't be room for all of them. I have notes written on alot of them and I can only hope someone like you will take them home to treasure & love them once again! That is so sweet. I'm glad that you apreciate something old, makes me smile. Merry christmas Erin! btw - when are we going shopping?